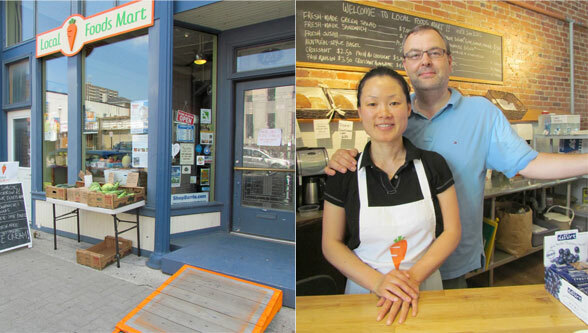 Chan Ju Park and Julian Daniel, foodies to the core, were tired of driving far afield to purchase the culinary items they ate in their own home, so they decided to open this amazing little market. With a lifestyle approach to eating and cooking, they have stocked the shelves with their favourites of locally sourced, fresh produce, and products, grown and prepared for the most part, in Simcoe County. Most items are labelled with their place of origin and how far they have travelled to arrive in Barrie. With exposed brick wall, tin ceiling and wicker baskets for use while you shop, the Local Foods Mart captures the essence of the local corner store of years gone by, only better. The basics are here; milk, eggs, (including duck and quail), and cheese, but you also will find artisan breads from three local bakeries, organic greens, fresh veggies, Montreal Bagels, Korean Sushi, ice cream, soups, sauces, meat, sweets, coffee and fresh frozen prepared meals from some of the best local chefs; including Marco Ormonde from The North Restaurant, Vince Galati from Gio’s, Chef Patrick Bourachot from Café Chartreuse, Angelo Pidutti from Cravings…and the list goes on. This is a perfect gem of a grocery store; catering to foodies and downtown residents alike, with wheelchair access, a takeout counter and knowledgeable helpful service. Gluten free, no problem, I can personally recommend Micah’s brownies. Another item Julian insisted I try was Belly Ice-cream, all natural, and “no funky stuff”, made in small batches, so tucked into the funky cloth shopping bag with my purchases was a tub of Buttered Scotch Whisky with Salted Caramel and Smoked almonds, absolutely divine! Sheldon Creek Dairy Whole milk went home with me too, a memory in a glass bottle of days long past, where the cream surfaces to the top and can be shaken in or scooped off to enjoy separately. Words alone can not do justice to Local Foods Mart, I think it best for you and your taste buds to go and explore. Chan Ju and Julian hope to inspire us to buy local fresh foods, to support our farmers, our dairy’s, our grain producers, as shopping local enriches our bodies and our community. This is real food folks.